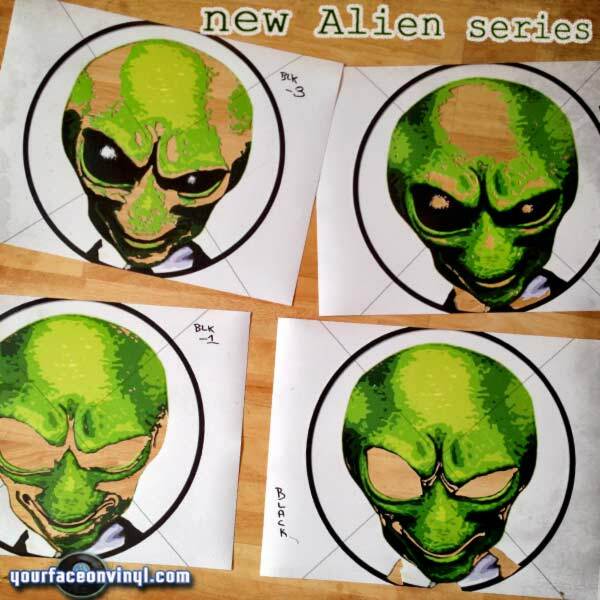 Your face on vinyl proudly present news of a new series of Alien art stencils to be produced, here you can see previews of the stencil before they have been sprayed. 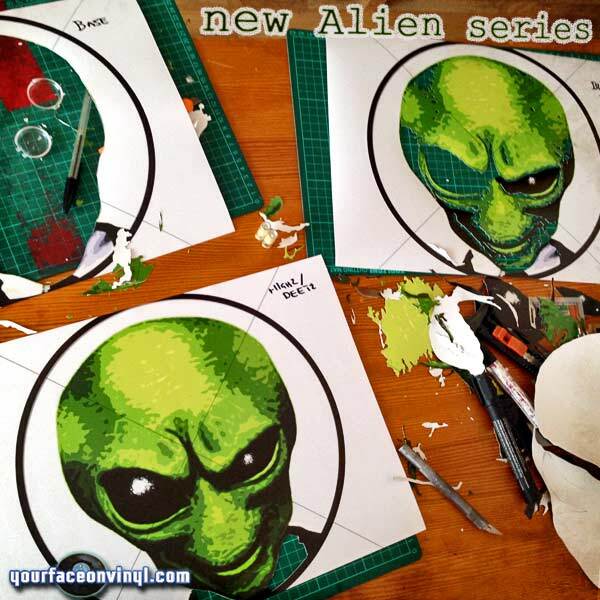 These Alien stencil vinyl art will be sprayed live tonight at a gallery location in East London, all the pieces spray painted will be available for purchase tonight at a special discount in gallery price. Whatever is not sold will be displayed on our online store. I’m very hyped and excited to be creating a new mini series of limited edition art on vinyl stencil art pieces. Alien Stencil progress, each layer is carefully cut by hand before being ready for spray painting, in this example we have made a 7 layer deep stencil for the art on vinyl record. 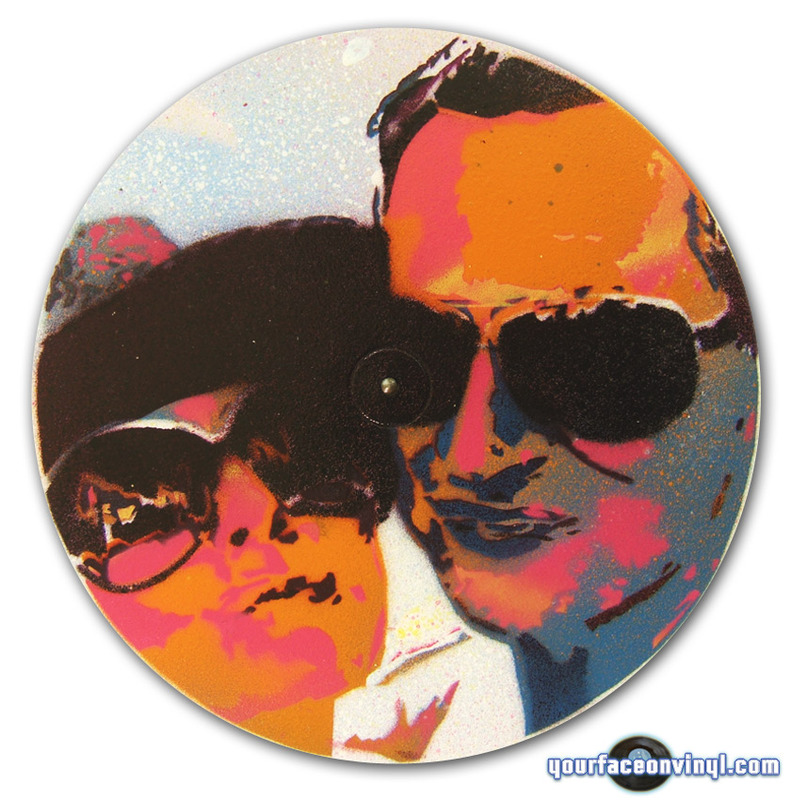 Groove is in the art is a retrospective collection of stencil art portraits on vinyl, created by Vinni Kiniki, an internationally exhibited artist who has been producing unique artworks for over a decade. 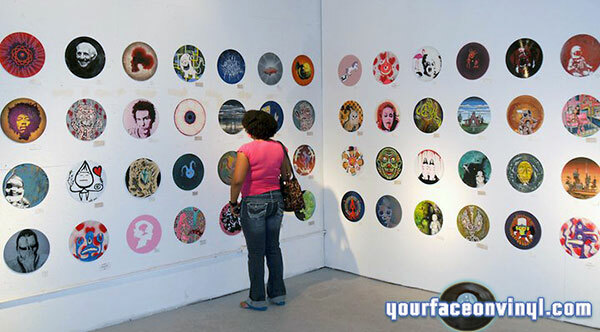 The exhibition will showcase both old and new, all limited-edition, vinyl stencil art pieces, for sale at affordable prices. 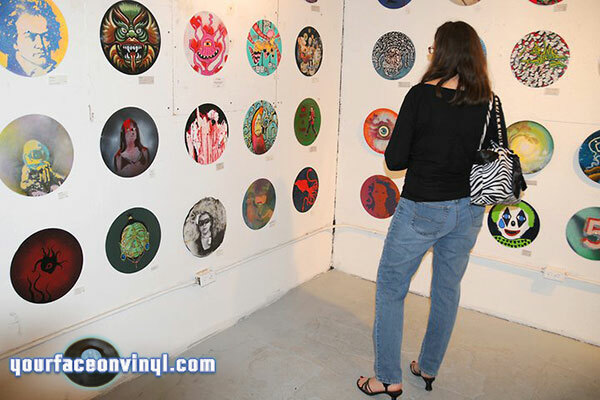 These visually powerful, aesthetically striking works are a unique addition to any collection and will most likely become timeless treasures as the vinyl medium itself. 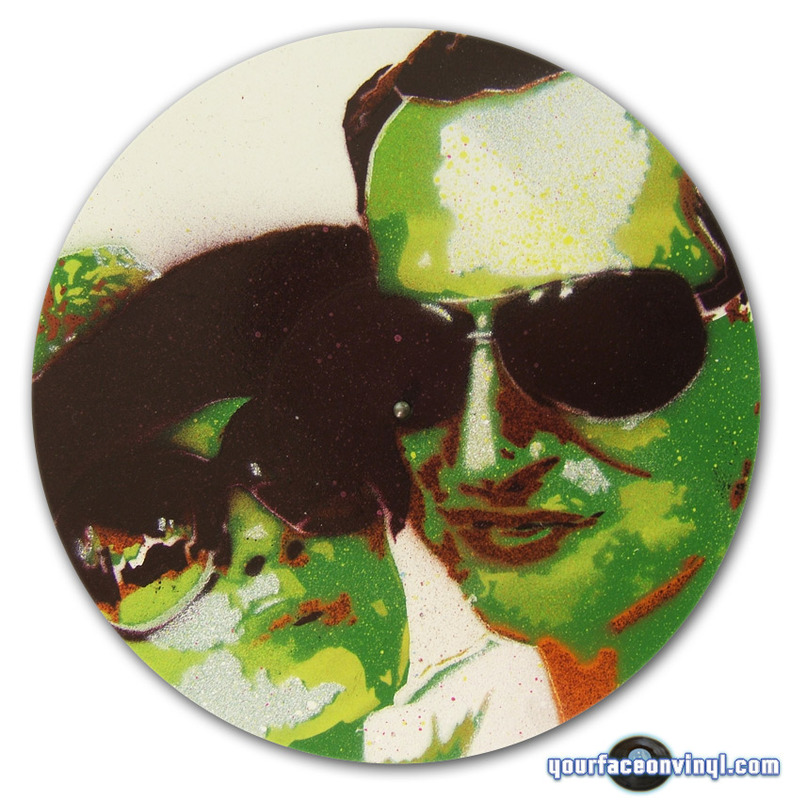 The artist’s original take on stencilling yields detailed and vibrant multi-layered pieces. While the work is reminiscent of contemporary street artists such as Banksy and C215 (to name a few), it simultaneously nods to the classic crisp sensibility of pop artists such as Andy Warhol and James Rosenquist, although one could argue there is a hint of Pollock lurking in the splattered yet insanely controlled textures in abundance within the crisp arrangements. It is fitting therefore, that the works are painted onto timeless genre-spanning medium of 12” vinyl records, which in its reluctance to stay buried in the distant analogue past, has found more than one way of moving onward in an every cold and calculated digital age. The pieces on display may, at first glance, appear to be digitally-printed portraits of famous musicians and cult pop icons, on closer inspection however, the work reveals the fruit of a deep and intense love-affair between the artist, the stencil art process, the painted subjects as well as the very medium upon which they are painted, Vinyl. The artist himself draws deep parallels and reflections between everything he creates artistically. 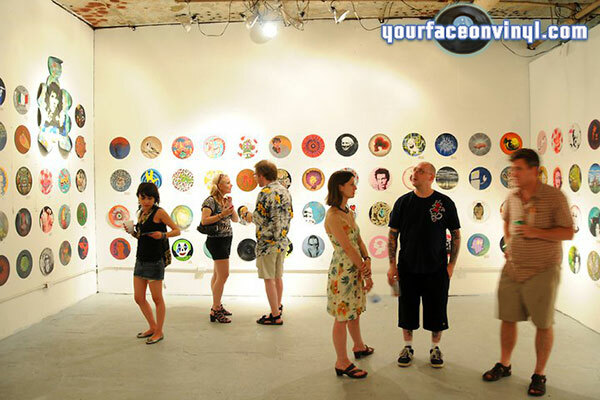 The stencil art pieces are no exception, portraits in this exhibition aim to evoke and celebrate the sensibilities of the artist and of the subjects he paints onto the 12” record, in a type of visual mood synesthesia. The subject of each individual piece influences all of the above. 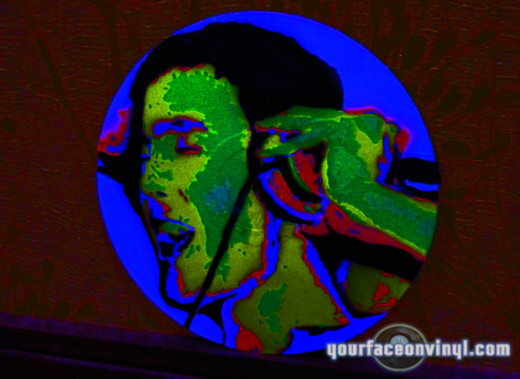 Akin to a record label for musicians, all stencil works produced by the artist are released on Vinni’s self-run indie art label, ‘Yourfaceonvinyl’, featured in magazines, and toured (exhibited) internationally, where you can buy limited edition art ‘releases’, stencilled onto vinyl records and. 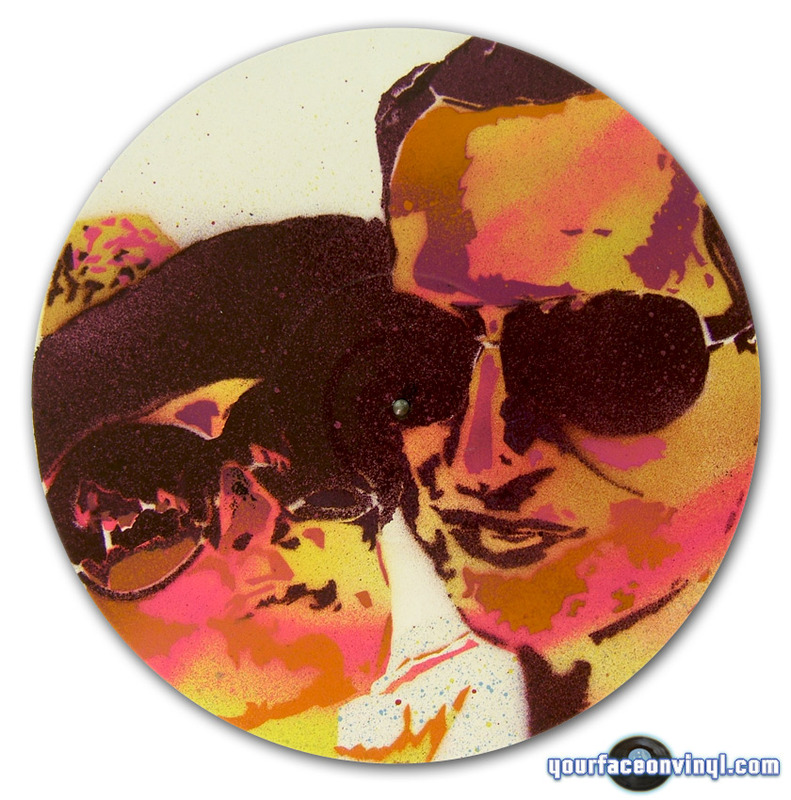 It is also possible to order custom photo to stencil art pieces on both; vinyl and canvas, his clients are international and each piece is created with nothing but pure love and soul, the result is evident in the reactions from the customers, there’s no such thing as paying too much attention to detail, and there is no shortcuts to perfection. Don’t be fooled by the slickness of the packaging, this is art in every sense of the word. Every Thursday during the exhibition come to one of the Artist hosted events at the gallery to get an insight into the artist’s creation process and get to meet the artist in person. 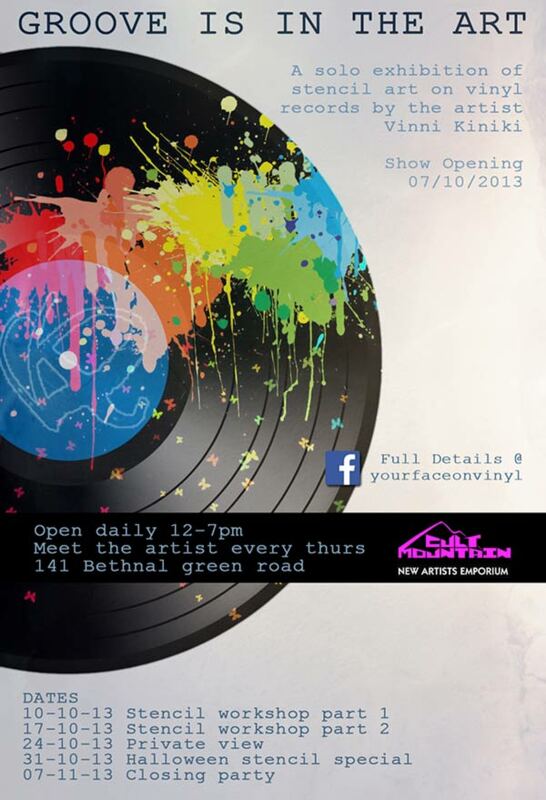 Vinyl has been the life-blood of clubs for decades and remains hallowed by more than one generation. It has provided the soundtrack of liberated cultural expression and hedonism far longer than any binaries have. Vinyl is not just for listening to, vinyl in itself is art, even before I painted on its surface it was at least as beautiful as a Mona Lisa, more packed with content then any Dean Koontz post-modern reference, a great mind like Nicholas Bourriaud recognized it’s brilliance, Christian Marclay probably spunked all over his 1’s and 2’s more than one time. If the artist/musician innuendic parallax is not treason enough, the only forgiveness I ask from the music gods, is that they look upon me in good favour, as in the same way they chose to bestow fortune on the great musicians and abandon others to oblivion, I have turned vinyl copies of one hit wonders into works of art celebrating those widely acknowledged as legends, for good reason. Indeed, no Jimi Hendrix 12 inch LPs were maimed in this process. 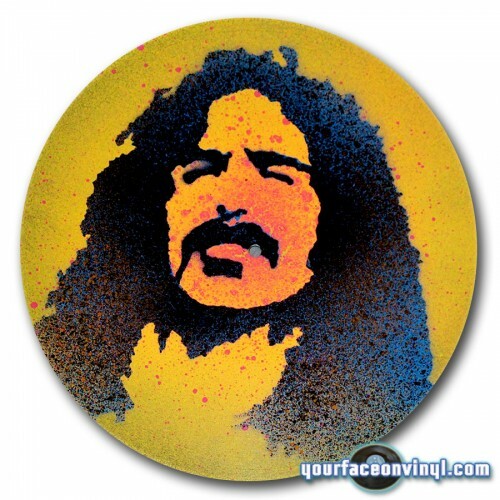 The vinyls I paint on have been abandoned by all self-respecting collectors to the wasteland of bargain buckets the last hope of musical gene pool survival. 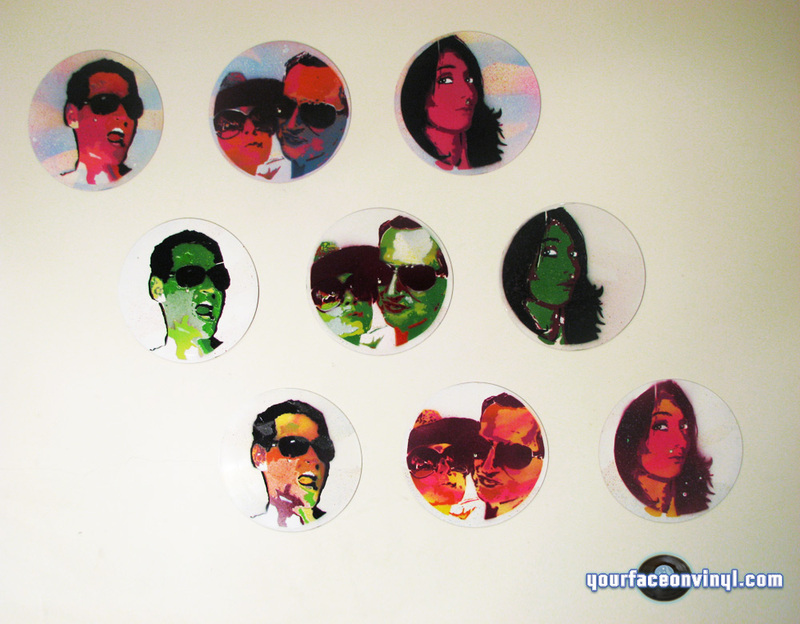 Your face on vinyl, which creates unique bespoke stencil portrait gift art is on the look out for some studio/store/office locations in order to promote and sell it’s product. 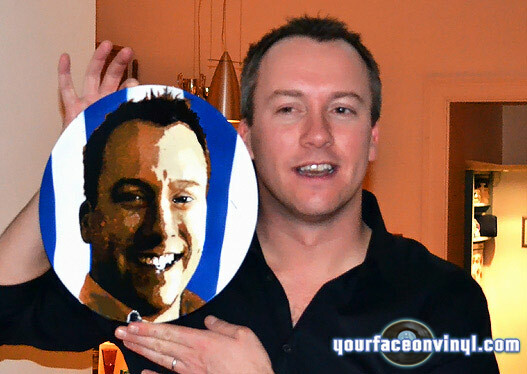 We are able to cross promote your venue by running advertising on our facebook page and also featuring a an advert for your business on our page which shows all locations where we feature our art stencil portrait gift art. Please see this link to a page which gives an example. At present we have got a few locations but only one has been fully realised and placed online, we are discussing other locations but certainly we would be interested to hear from you if you are interested to do a little trade. We are offering commission for any sales through your venue location and also we can talk about creating a unique limited edition series to sell from your business location. For more information please send us a private message on the contact page. 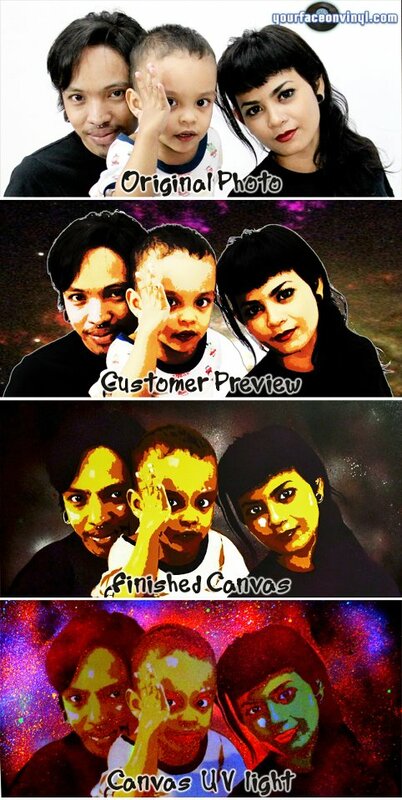 more info on this family portrait on canvas by your face on vinyl coming soon!